TACOMA, Wash. - Russ Ladley, resource protection manager for the Puyallup Tribe, steers his pickup off the highway. Stepping over a guardrail, Ladley and fisheries biologist Blake Smith hike below the road to a small tributary of the Puyallup River, whose muddy waters, the color of a double cappuccino, swirl north toward Puget Sound. Unnoticed by the motorists whizzing by above, Ladley points to the stagnant water that leaks slowly through what looks like a large rusted submarine hatch. It's a culvert, he explains, designed to protect downstream communities from floods. When the river rages, the hatch opens, allowing water to funnel through the opening, rather than spill onto the road above. In normal water, however, the hatch only opens a crack, preventing fish from reaching 58 acres of wetlands, prime salmon spawning grounds. Ladley shakes his head in disgust, and says, "This doesn't do a damn thing for fish." 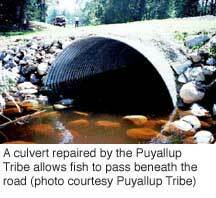 This is just one of thousands of culverts that prevent endangered fish from returning to their natural spawning grounds every year. These barriers were built beneath roads and railroad tracks in the same era when many dams were constructed, and the idea of salmon extinction was unimaginable. But unlike dams, culverts don't have a constituency. Nobody profits from culverts; they generate no electricity, and everyone wants them fixed. The problem is finding the money and political will. Although Gov. Gary Locke, D, has proposed $40 million over the next two years, state officials say repairing the 2,400 state-owned culverts could take up to 100 years. That's too long, say Northwest tribes that are frustrated by declining salmon runs. In January of this year, 20 tribes filed suit against the state of Washington, claiming that the state is violating treaty rights to fish by failing to provide healthy habitat, unobstructed by culverts. "The tribes believe the state has done very little to upset the status quo," says Phil Katzen, an attorney for 11 of the tribes filing suit. "The culverts are an example of that - it's pretty clear that there isn't enough sense of urgency." Salmon runs in the Puget Sound area have declined precipitously over the past 15 years. Until the early 1970s, the tribes took 500,000 fish, or 5 percent of the catch. But in 1974, federal judge George Boldt ruled that tribes are entitled to half the state's salmon catch. Because of the ruling, commonly called "the Boldt decision," the tribes' catch rose to 5 million by the mid-1980s. But, by the end of the century, salmon runs had plummeted to the point where tribes, even when allotted half the catch, were back to taking only 500,000 fish. These declines have had a noticeable impact on reservation economies, says Terry Williams, Commissioner of Fisheries and Natural Resources for the Tulalip Tribes of Washington. The number of fishing vessels owned by tribal members has dropped from a height of 130 boats to just 30 in less than a decade. "That's pretty devastating in itself, but there's a lot more involved than just economics," says Williams. "Fifty years from now, we don't want to be telling our children stories about casinos." 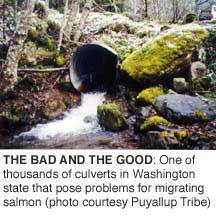 In anticipation of the listing of Puget Sound salmon as endangered species, the state issued a report in 1997 that found by fixing the 2,400 state-owned culverts, over 200,000 additional salmon would return. Since then, several species have been listed and tribes and state authorities have been deadlocked in negotiations over a timetable for unblocking streams. These talks broke down last summer, when the tribes insisted the state admit it had a treaty-mandated obligation to maintain salmon at harvestable levels, not just recover the fish listed under the Endangered Species Act. "The listings only address certain runs of salmon that are critically endangered," says Katzen. "There are plenty of other salmon runs that are way below what they ought to be. And the ESA doesn't do anything to protect those directly." The chum salmon, for example, a fish that is the Puyallup Tribe's bread-and-butter catch, is one of those unprotected runs. Environmental groups have generally welcomed the tribe's lawsuit, and are hopeful that habitat-maintenance standards will increase throughout the region as a result. "It just makes logical sense that this is what the treaties are about - when those treaties were signed, there were abundant salmon runs," says Nicole Cordan, policy and legal director for Save Our Wild Salmon. "I think it will probably have far-reaching implications for the whole region." Cordan says tribes along the Columbia River are closely watching the outcome of the present case to judge whether to file lawsuits of their own. Veto power for the tribes? The lawsuit rankles state officials, who say the state has been taking steps to protect salmon since the ESA listing. These efforts have been more than sufficient to meet treaty obligations, says Curt Smitch, the governor's special assistant for salmon recovery. He notes that Gov. Locke's current biannual budget requests $250 million for salmon recovery, and that the state recently created guidelines that prohibit new development on the water's edge in an effort to prevent erosion and poor water quality. In addition, several deals with private forest owners have resulted in 8 million acres of newly protected forests and watersheds, says Smitch. That's why Smitch and the state attorney general are convinced the tribes really want veto power over all statewide decisions that impact salmon. "They (the tribes) made it clear to us, very explicitly, that the issue is not about culverts, but that this issue is about the larger duty that they believe is required by the treaties," says Smitch. "When you talk about a duty to avoid impacting the environment that fish spawn in and are reared in, then you're talking about land-use practices and water. The state is simply not going to relinquish its authority over those issues." But the state may not have a choice, say some legal experts. "The tribes have got a powerful case, a very logical case," says Robert Anderson, director of the Native American Law Center at the University of Washington. Even so, Anderson says court-ordered changes in how the state manages habitat could be a long way off. Like its predecessor - the complex Boldt case - this lawsuit could languish in court for years. But back at the Puyallup Tribe's fish hatchery, Russ Ladley says the tribe is changing what it can. He points to a culvert the tribe has retrofitted with a series of weirs to help spawning salmon. While the repairs cost $75,000, tribal biologist Blake Smith says it's worth it. He releases several hundred thousand chum fry and stands above the ditch, proudly watching as the tiny fish mill and shift in the little stream below the new culvert. From here, they'll head out to sea. In this stream at least, they have a chance of making it back some day. Andrew Engelson writes from Seattle, Washington. Native American Law Center at the University of Washington School of Law, 206/543-4551, www.law.washington.edu/IndianLaw.